These days I don't get the chance to do nearly as much groomed cross-country skiing as I'd like. So when our kids made plans to spend Sunday with the grandparents, Beth and I jumped on the chance to get in a skinny-ski workout. The only hitch, if you hadn't noticed, is the minimal snow cover we're currently experiencing throughout the Adirondacks. Mount Van Ho?... a 1K loop on manmade snow with a "rock ski advisory" for a few more K. Garnet Hill Lodge?... 15K with warnings of "variable conditions and icy patches." Lapland Lake reported in with good skiing on 34K, just about their entire trail system. I knew from experience that I could rely on Lapland's impeccable grooming and honest reporting, so it didn't take long for us to make our decision and pack the car. You could look the skiing today from a glass-half-full / glass-half-empty perspective. 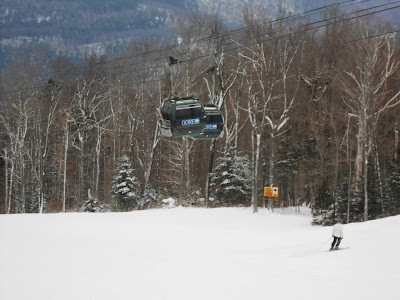 On the one hand, there's a respectable amount of terrain open, the mountain absorbed a huge number of holiday skiers with minimal lift lines, and the snow was overall better than the advertised machine groomed loose granular. On the other hand, last weekend's dismal weather dealt a big setback to what had been one of the best early seasons in recent years. 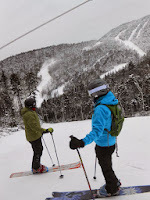 I wrote the following article on getting started in skiing for Adirondack Sports and Fitness last winter. I don’t know how people get through the winter hibernating indoors. If you’re reading this, chances are pretty good you’re already an active, outdoors-minded individual. Maybe you snowshoe, hike, or even run or bike during the winter. If you’re not a skier, or are considering re-entering the sport after a long absence, the prospect of learning the sport can be intimidating. Here are some tips to get you pointed in the right direction. You’ll be rewarded with a lifetime sport that you can enjoy with your friends and family, sharing the joy of soaring through a beautiful winter landscape. There’s a lot of things I love about skiing, but at the root of it all is the simple joy of being out in the woods, in the snow. The nicer the snow, the bigger my smile. And when the snow is good around home, my favorite thing to do is to head out the back door for a tour of the woods that surround our house on my cross-country skis. But the short daylight hours of mid-winter and my job in Albany make it difficult to get out in the snow as much as I’d like, so when the snow is good I grab my headlamp and go on night patrol. With 10 inches of new snow Saturday night, it's no surprise that this weekend presented the best ski conditions of the season so far. 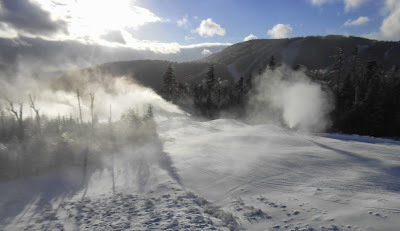 Skiers brave enough to endure Saturday's cold temperatures found that Gore's snowmaking crews had done an amazing job in the past week getting the summit terrain open, with Hawkeye, Chatiemac, Lies, Open Pit, Cloud and Headwaters all coming online. And despite the cold, the summit was the place to be with chalky, edgeable snow on all trails. It was boys' day out for Daniel and me, since Beth and Sylvie had Sylvie's 6th birthday party. With the thermometer at the Straightbrook quad never cracking the zero mark, it was probably just as well that the girls missed out. 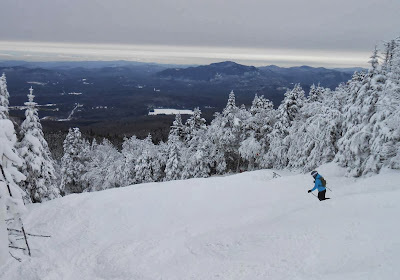 I’ve said before that Whiteface always seems to deliver, and Wednesday was no exception when Beth and I attended Whiteface’s Media Day for a day of skiing with Whiteface and ORDA staff. We’ve been going to this event for 3 years, and this year featured some of the nicest conditions we’ve seen. 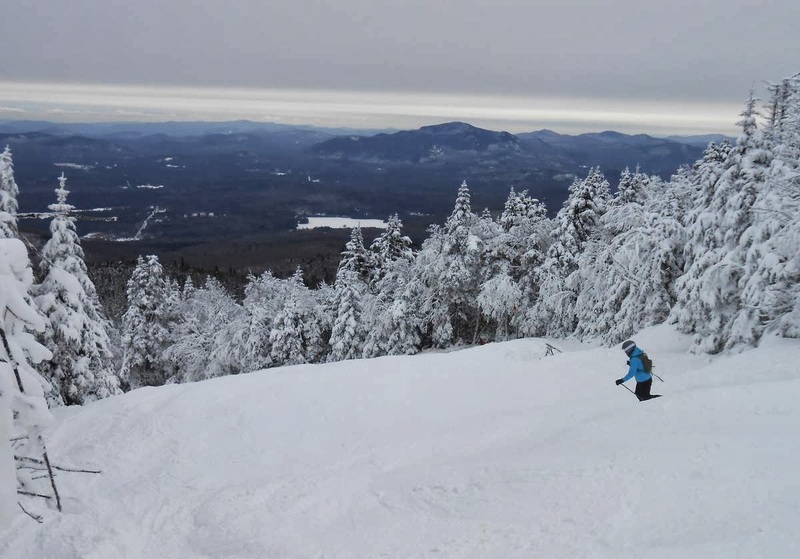 After opening for the season two weeks ahead of schedule, Whiteface’s snowmaking crews have been able to open terrain at a faster pace than the mountain has seen in several years. Grooming crews did a nice job getting the mountain back in shape after last week's warm temperatures, but the hoped-for summit terrain remains on hold. 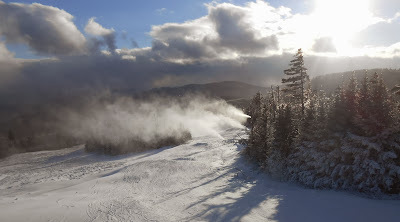 With the return of cold temperatures over the weekend, snowmaking was in progress on Cloud, Open Pit and Uncas, so it seems very likely that the Straightbrook chairlift and summit terrain will open before next weekend. Even with the set-back of last week's weather Uncas, Pine Knot and Tannery are now open. Prolonged cold in the wake of last week’s pre-Thanksgiving rain has allowed Gore’s snowmaking crews to expand trail counts and produce excellent early-season conditions. Just about everyone on the hill Sunday was commenting about how good the skiing was for Thanksgiving weekend. 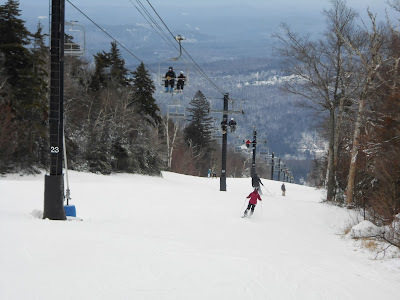 Instead of the more typical Thanksgiving offerings of sketchy coverage on a single route, just about all of the East side terrain is now open (Twister being the only notable exception).